Surface charge density is a basic quantity that is directly relevant to many phenomena, from surface interactions to DNA hybridization. Measurement and quantification of surface charge density can lead to a better understanding of biomolecular interactions on surfaces. 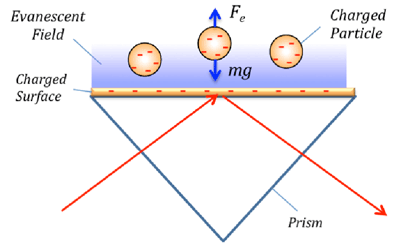 To date, different techniques have been developed to measure surface charge density, including potentiometric titration, atomic force microscopy and reflection interference contrast microscope. These techniques are useful but also have their drawbacks. Shan et al  has recently reported a Surface Plasmon Resonance (SPR) method to measure surface charge density. The method, as Shan et al described in an article published in Analytical Chemistry, is based on two important facts (FIG. 1). First, the equilibrium distance between a charged particle and a charged surface depends on the electrostatic interaction between the particle and the surface. Second, the SPR response is extremely sensitive to the vertical position of an objective over an SPR sensor surface. This unique SPR feature can be used to accurately measure the equilibrium distance. If the particle and surface are charged, then the equilibrium distance is determined by the balance between gravity and electrostatic force on the particle. Both numerical simulations and experiments carried out in this work show a simple relation between the surface charge density and SPR response, which leads to a sensitive method to determine surface charge density. FIG. 1 The equilibrium distance between a charged particle and charged surface is determined by the balance between the electrostatic force and gravity on the particle, which depends on the surface charge density. SPR can accurately measure the equilibrium distance, thus the surface charge density. The sensitivity of the method depends on the particle size and concentration (FIG. 2). Smaller particles are, in general, more sensitive than larger particles. However, if the particles are smaller than ~1 µm, then Brownian motion becomes important, which changes the relatively simple relation between SPR response and surface charge density. Higher particle concentrations are also more sensitive, but the upper limit is determined by the full coverage of the surface with particles. The particles demonstrated in this work were negatively charged silica particles, which acted as probes and amplifiers for sensitive detection of surface charge density. Other micro- and nano-objects, insulating, semiconducting or metallic, may also be used as probes, as long as their optical properties are different from that of the buffer solution. Finally, it is important to point out that the method can, in principle, determine the charge of micro- and nano-scale objects if the surface charge of the sensor is known or calibrated. FIG. 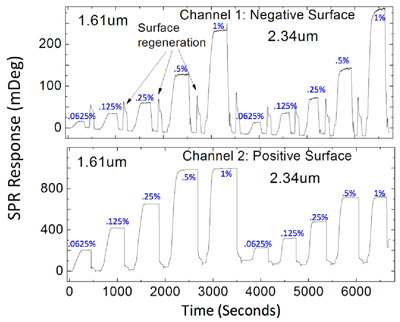 2 SPR response during the injection of silica particles of different concentrations and sizes for both positively and negatively charged surfaces. The small spikes in between injections are caused by surface regeneration.